Jam along to Mozart! 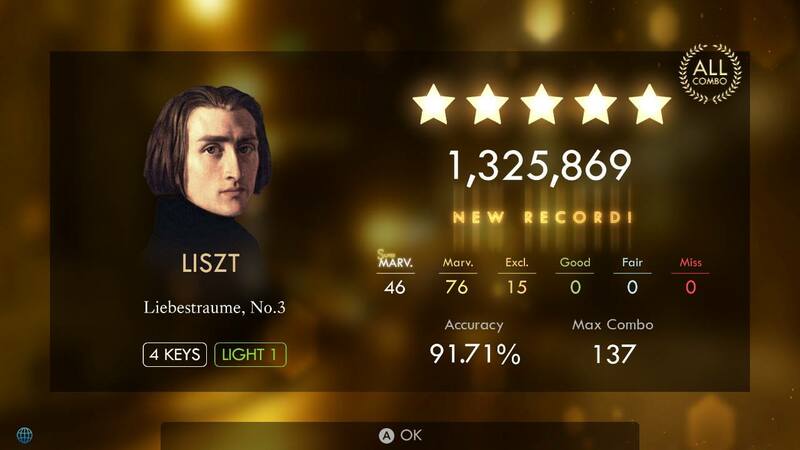 Saunter smoothly with Liszt! 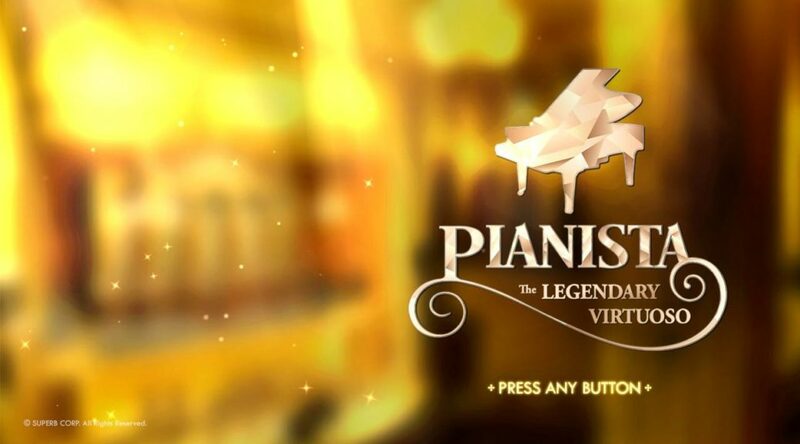 In this review, we examine if the classic trappings of Superb Corporation’s Pianista: The Legendary Virtuoso are worthy of applause in today’s rhythm game market! If you’ve encountered other rhythm games like Musynx, you’ll more or less know what to expect from Pianista. This piano-centric game features 4-button or 6-button layouts, with various difficulty settings that determine how many keys you must hit per song. 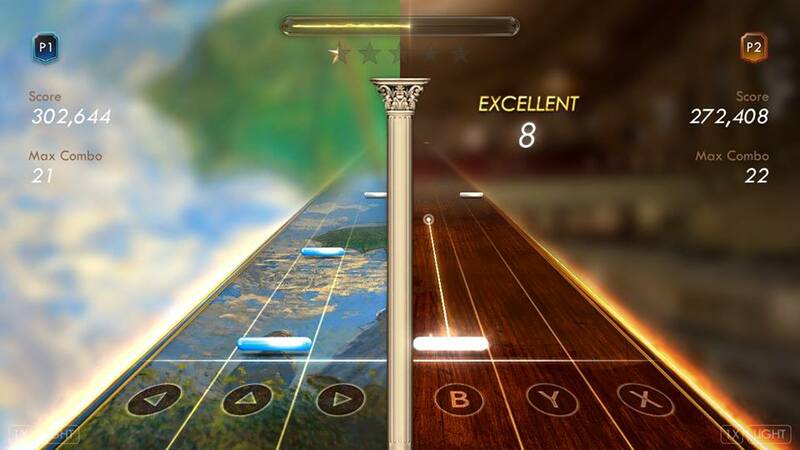 Free-play comes in the form of ‘Matinée Mode’ – where you’ll be playing songs in three successive tiers, with each tier introducing progressively harder songs. While a little restrictive, it’s a novel spin that keeps sessions interesting and challenging. Instead of just sticking to a smaller subset of favorites, players will find themselves nudged into trying out every song eventually. You can also push your skills further in ‘Concours Mode’ – which offers 30 preset challenges as a linear campaign. 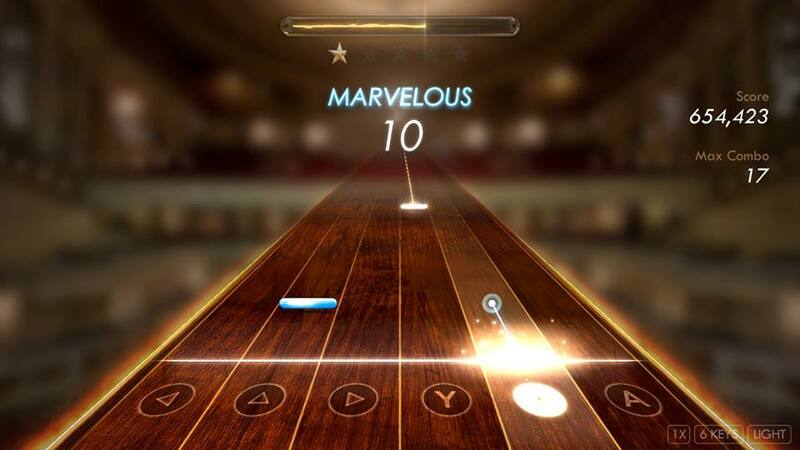 Each challenge comprises of four songs in succession, and tasks players with achieving a target score. Beating the target score unlocks new piano skins – with each one offering pretty cosmetic changes. Pianista also features a ‘health’ bar of sorts – so it’s not exactly going to be a walk in the park. Miss too many keys, and you’ll fail the stage. There was actually a real push to improve beyond my current skill ceiling, which was greatly appreciated. 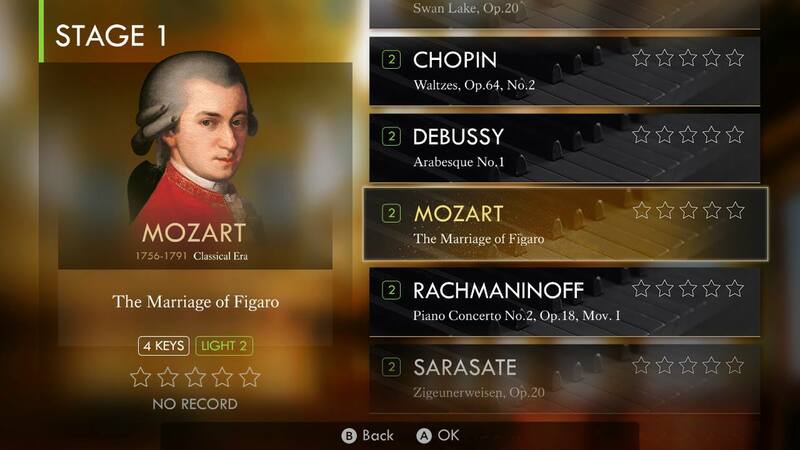 These quirks aside, Pianista: The Legendary Virtuoso seems pretty similar to other contenders in the Rhythm game market. There’s something magical about playing through Pianista’s classical library, compared to the contemporary offerings of other rhythm titles. It helps that most (if not all) of the game’s offerings are pretty much evergreen. From Chopin’s ‘Nocturne’ to Liszt’s ‘Liebestraume’ – I never really found any songs grating to my ears. In fact, many of Pianista’s compositions were entirely unfamiliar to me – so each session felt like pleasant surprises were waiting around every corner. This is the rhythm game’s greatest strength. Unlike many Japanese songs that get repetitive or insular with time, much of Pianista’s music library has aged like fine wine. Every composition was worth exploring, and I never really feel like any song was tacked on or throwaway. Pianista’s quality content is further bolstered by its stellar visual presentation. Menus look refined and vibrant with a golden sheen – and it felt like I was experiencing a premium product. It wouldn’t surprise me if this game received a physical release in the future, given how tight the entire package is. 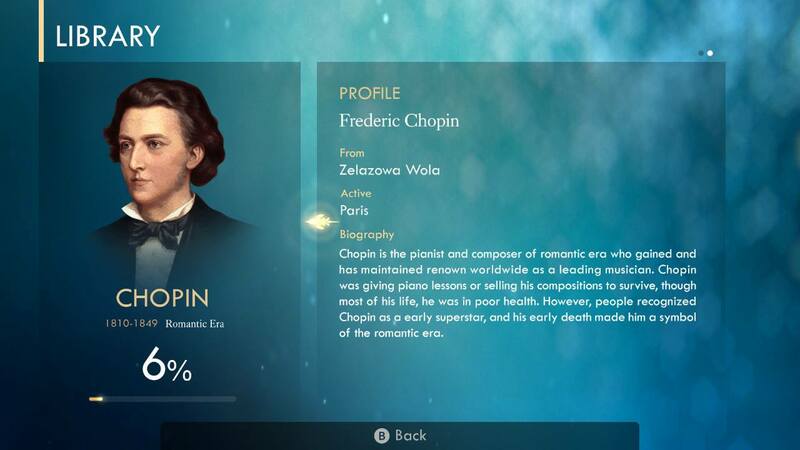 Unless you somehow have a vehement hatred against piano recitals, the game’s soothing experience and great presentation easily justify its $24.99 price tag. Pianista’s coolest feature, however, has to be its two-player ‘Ensemble Mode’. By using split Joy-Con, two people can tackle a six-button stage together – with each person handling three buttons. The mode is an interesting mix of cooperation and competition. Both players share the same health bar, so one person failing will lead to a Game Over for everyone. Conversely, both players have separate score indicators – so it’s not hard to see two friends trying to outdo each other. It’s not the most revolutionary addition to the rhythm genre – but it can make for some great quality time. If you have some close family or friends, Ensemble Mode is a fantastic way to chill out together and unwind after a long work week. Of course, the game isn’t pitch-perfect. First, Concours Mode might be a little too challenging. To beat a challenge’s target score, you pretty much need to achieve a perfect combo streak throughout each four-song session. 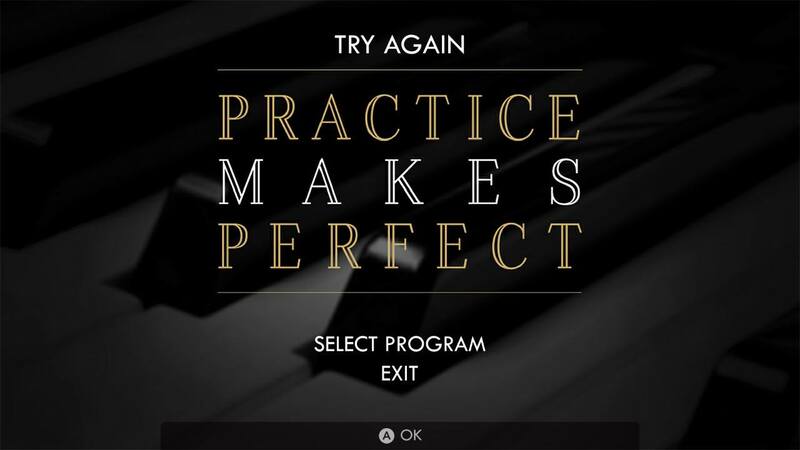 This makes it nearly impossible for novices to unlock new piano skins – which can feel very discouraging. It wouldn’t surprise me if some players retire from Pianista because of how brutal Concours Mode can become. Secondly, the game does have a limited shelf-life compared to its modern counterparts. While its 77 tracks can be mixed up with different difficulty settings, you might get a sense of Déjà Vu after several hours of looping back to the same compositions. For comparison’s sake, Deemo boasts over 200 eclectic songs, and Musynx now has more than 90 tracks. In short, Pianista’s value proposition depends on whether you prefer quality over quantity. Flaws aside, Pianista: The Legendary Virtuoso fills a fine niche in the market – and will certainly stand out in the libraries of rhythm game fans. 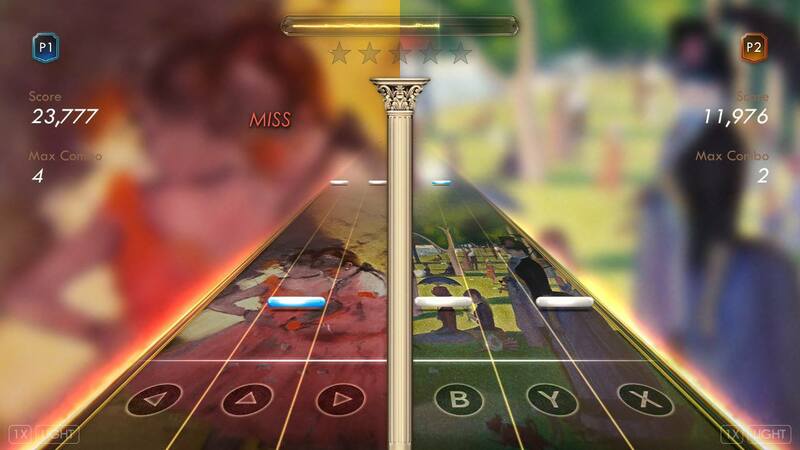 Each of its various modes offer something unique – especially the two-player Ensemble Mode. 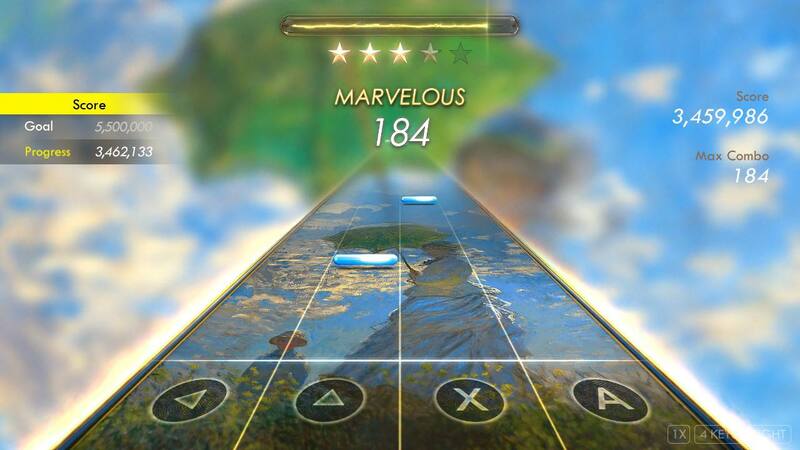 Novices will find a soothing entry into the world of rhythm games, while veterans will appreciate something quite different from the rest of the genre. All in all, this is one performance you shouldn’t miss out on. Classical songs feel refreshingly new in today’s market. Visual presentation is stunningly refined, and feels premium to a tee. Ensemble Mode is a cool multiplayer spin on the rhythm genre. Concours Mode can get difficult as nails, making it tough to unlock new piano backdrops. While refreshing, the library of 77 songs feels limited compared to the competition. SOUP VERDICT: Although each bowl won’t last you long, this soup is top-tier stuff. A review code for Pianista: The Legendary Virtuoso was provided by the publisher for the purpose of this review.